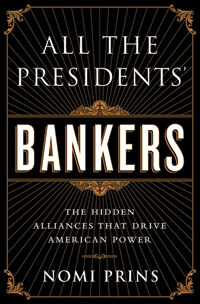 Calling a book a “tour de force” is a cliché, but every once in a while this overused phrase fits, and that is the case with All the Presidents’ Bankers by Nomi Prins. Consider what Prins has pulled off in this meticulously researched yet readable work (her fourth book about the U.S. financial system): nothing less than tracking the often unholy alliance between American presidents and bankers across a century of American history, two world wars, the Cold War, market booms, busts and panics, and bailouts funded courtesy of American taxpayers. The titans of Wall Street and the occupant of the White House — regardless of political party — have been joined at the hip for decades, though, as in all marriages, there have been periodic spats. Teddy Roosevelt railed against the trusts and the concentration of wealth, but when the Panic of 1907 struck, TR tempered his attacks and stepped into line behind the bankers. During the Great Depression, Franklin Delano Roosevelt sounded a populist chord by castigating the power and privilege of the titans of finance and industry, but much of that ire was only for show. The key financiers of the time were FDR’s people — fellow bluebloods educated at the same universities, members in good standing of the same exclusive clubs and social circles and often related by marriage. Eric Holder, the incumbent Attorney General, has admitted that today — more than five years after the financial meltdown of 2008 — a coterie of American banks are simply too big, powerful, and interconnected to fail or jail. The irony is that the federal government was complicit in allowing banks to become behemoth in the first place. This fact may account for the haughtiness JPMorgan Chase chairman Jamie Dimon displays when he testifies before Congress, but Dimon’s demeanor is hardly different than J.P. Morgan’s was when he testified before the Pujo Committee in 1912. Too big now, too big then.